DEFTHANE® Interior/Exterior Oil-Based Polyurethane is an oil modified urethane that gives the most professional results on a wide variety of wood surfaces. 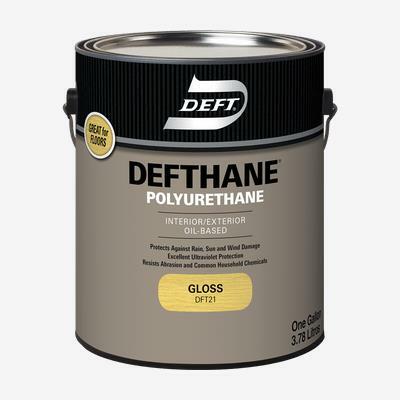 DEFTHANE® provides added protection from water, sun and wind damage. This advanced formula contains both UV absorbers and UV inhibitors to deliver excellent ultraviolet protection and help to prevent fading and discoloration caused by the damaging effects of the sun. It is ideal for stained or bare wood surfaces and ideal for wood doors, interior floors, furniture, trim, garage doors and more.